Zombies are just as popular in video games as they are in film and television but the post-apocalyptic monster scenario usually lends itself to online gameplay in multiplayer games rather than single-player experiences. There are still plenty of quality offline zombie video games to play though on the Xbox One, PlayStation 4, and Nintendo Switch consoles. Here are eight of the best. Storylines and characters are as captivating as those in the TV shows and comic book. Equally as fun to watch someone else play as it is to play yourself. The graphics engine can be a bit buggy at times and stutter. Chapters of each game are sold separately and as bundles which can be confusing. Telltale Games' numerous titles are known for their quality storytelling experiences and strong voice acting and their The Walking Dead video games are no exception. 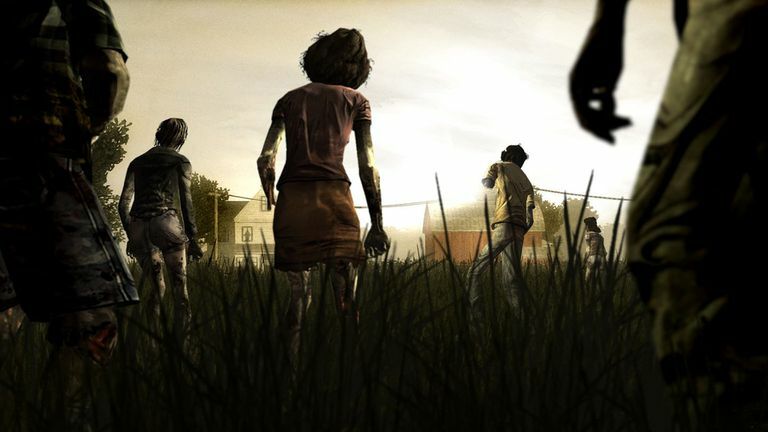 Like other Telltale video games, all of the The Walking Dead games task the player with making both major and minor dialog choices for the characters but this time the characters are a group of survivors in the zombie apocalypse. Make sure to buy the Complete versions of Telltale Games video games so you get all of the chapters in the story. Chapters can be bought separately but doing so can often be more expensive. It's kind of like a Choose Your Own Adventure book. Some choices will have fatal consequences for characters while others will determine how members of the supporting cast feel about you. What's particularly cool is that all of your decisions that you've made in any previous games you've played will carry over to future ones so you can see what effect your choices have in the long-term. Captures the retro brawler playstyle and visuals perfectly. Will appeal to mature gamers who miss games like Double Dragon or Turtles in Time. No local multiplayer is a huge missed opportunity. All of the blood makes this inappropriate for younger players. A creative spin-off from the more realistic, multi-player focused, main Dead Island video games, Dead Island Retro Revenge is a homage to the 16-bit brawlers from yesteryear with a strong emphasis on fun and action. There's no deep storyline within Dead Island Retro Revenge to be discovered, but sometimes you don't need one. This is old-school arcade zombie video game fun that's perfect for parties or casual gaming sessions. An original setting compared to other zombie video games. Respawning as a completely new character and seeing your old self as a zombie is thoroughly entertaining. Being a WiiU port, the graphics aren't as good as other modern games. It's challenging but deliberately so. This original offline zombie game initially came out on the Nintendo WiiU as ZombiU and, after a few years, eventually made its way to other consoles and was renamed as Zombi. Whichever version people play, most are usually impressed with how different it is to other titles in the genre. While most zombie games are set in the U.S., Zombi takes place in a post-apocalyptic London which creates a very different atmosphere than most gamers are used to. Something else that sets it apart is its approach to character death. When you die in Zombi, your character turns into a zombie and you start the game again as an entirely new person with a new name, body, stats, everything. What's more, if you make it back to where you had previously died, you actually encounter your old avatar who's now a zombie. Game can be played entirely solo and it's still a lot of fun. Online co-op is available if you want to play with others. No offline local co-op is disappointing. Story and characters are a bit cliché. Dying Light is a fun open-world first-person shooter set during a zombie apocalypse. The play area is incredibly large compared to other zombie titles and allows players to truly explore the environment and experience what it's like to survive in a city overrun by the undead. This game is designed with an online co-op feature that allows friends or strangers to drop into your city and help you out but all of Dying Light can be played offline and solo and is just as enjoyable when played by yourself. Local multiplayer is a lot of fun. A fun zombie video game for all age groups. Local multiplayer is limited to two-players. Maps can get repetitive after a while. Plants vs Zombies: Garden Warfare 2 is a title that pits the quirky zombie and plant characters from the popular Plants vs Zombies puzzle games against each other in an all-out action shooter. Players can choose to play as either the zombies or the plants in this humorous battle for the neighbourhood and, while the action is fast-paced and intense, the fun animations and cute character designs keep it from being too intense for younger players. Local offline modes are available for up to two players who can play against each other or on the same team. The game can also be played solo against AI opponents when going offline. Great mix of action and horror with high production values. Resident Evil games are available on all video game platforms. The latter games are more monster games than zombie horror stories. Some of the character designs are a bit cheesy. Most people will have heard of the Resident Evil brand due to the blockbuster movies but the films are actually based on incredibly popular video games. The Resident Evil video games are full of zombie action, jump scares, and genuinely captivating characters that have garnered quite a loyal following. You really can't go wrong with any Resident Evil video game but, as a rule, the early entries in the series are more about tension and horror while the latter ones have a more big blockbuster Hollywood feel to them. A great place to start is with the remake of the original Resident Evil which features improved graphics and manages to maintain all of the tension the game had when it was first released. The weapon crafting makes every game unique. The story and its characters are a lot of fun. Experienced gamers may find it too easy. Main character is a little bland and lacks depth. Dead Rising 3 places you in a city overrun with zombies with a set time to get out before the military blows it up. The city is well-realized with some stunning visuals and lots of areas to explore while the hordes of zombies you encounter are some of the largest ever created for a video game. Despite the initial appearance of realism and seriousness, Dead Rising 3 has a great sense of humor with its quirky characters and unbelievable customization options that allow you to turn almost anything into a weapon against the zombies tracking you down. A great game for short, fast gaming sessions. The levels can get repetitive and there's not much variety. I, Zombie, not related to the TV show of the same name, is a fun strategy game where you play a zombie who's trying to infect as many regular humans as possible. After you turn a human, you can command them to infect others or avoid the humans completely. As the game progresses, your zombie army grows and your chance of infecting everyone in the area increases.